At the February COVNA meeting, Kent Bedell, Landlord Outreach Specialist with the Housing Authority of the City of Austin (HACA), will speak to us about Section 8 Housing. He will explain how the program works. It is designed to provide assistance to families in need, while providing landlords with additional tenant options. Several houses in the neighborhood are rented by tennents participating in this program. You can learn about HACA at their website, http://www.hacanet.org/. Please attend this meeting to hear the complete story and to have any questions you may have, answered as completely as possible. HACA manages the Housing Choice Voucher/Section 8 Program that provides rent vouchers and certificates for almost 5,000 units of housing in Austin's private rental market. HACA pays a portion of the rent directly to the landlord. This program allows residents to choose the place in which they want to live. January’s meeting kicked off on a positive note as Doug DuBois asked each attendee to introduce themselves and relate their neighborhood experiences. Numerous interesting historical events and facts were described. One fact that emerged from the discussion is that the water pressure in our neighborhood is exceptionally high and has led to flooding of numerous homes. Many residents have gone to the expense of having a plumber install a water regulator because of this problem. An effort will be made to contact the city and see if they can affect an area-wide solution. John Blunt, who owns property on the NW corner of Monarch Dr. at Manchaca Rd, did not appear to discuss a change in zoning for his property. Anthony Schultz, who lives next door to the property, explained that he had alerted Mr. Blunt that he would oppose any zoning change, thus none will be requested. The current zoning allows anything from office space to use as a restaurant. COVNA will monitor any proposed development and attempt to minimize its impact on the neighborhood. Neighborhood watch signs will be purchased and positioned at entrance points into the neighborhood along with signs marking the boundaries of the Castlewood and Oak Valley neighborhood. The City of Austin will host the Green Garden Festival at Zilker Botanical Gardens from 1 to 4 p.m. Sunday, Feb. 29. The event provides information about how to implement beautiful, low-maintenance and environ-mentally friendly landscapes. The speakers include: 1-1:40 p.m. Sheryl McLaughlin, Garden Designs; 2-2:40 p.m. John Dromgoole, Organic Gardening; 3-3:40 p.m. Malcom Beck, Soil Tips. Outside demonstrations address landscape materials; rainwater harvesting; least toxic garden products; pruning; composting; mulch. Admission is free. Parking is available under the MoPac Expressway bridge on Stratford Drive. Hundreds of kites will color the skies over Zilker Park, 2100 Barton Springs Road, beginning at 1:00 Sunday, March 7, at the 76th Annual Zilker Park Kite Festival. This festival is the longest continuous running kite contest in the US. The free event is open to anyone. Entertainment includes stunt kite demonstrations, kite buggies, fighting kites, kite flying competitions and spectacular giant kites. 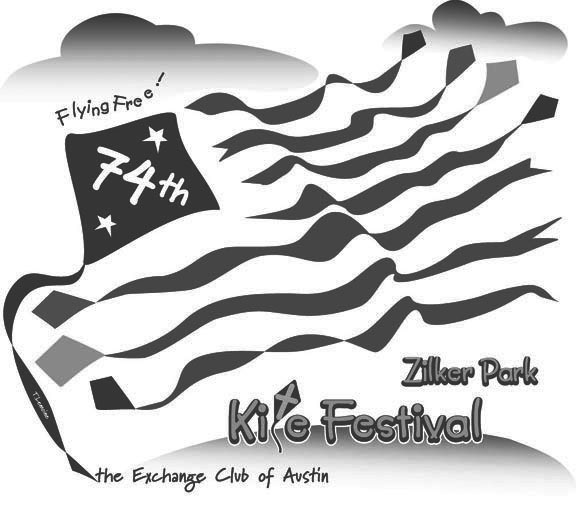 Visit www.zilkerkitefestival.com for information about competition categories. I know you’re busy. I’m busy, and I’m mostly unemployed, my kids pretty much take care of themselves (except financially), and being disabled, don’t even spend time cleaning up. I was certainly busier as a violinist in Austin’s symphony and opera, freelancing as much as possible, acting as the symphony’s personnel manager, and teaching the occasional lesson. I worked many nights and it seemed difficult to spend the odd Monday evening here and there going to COVNA meetings. But the times my wife and I dragged ourselves there I was always fascinated by the experiences related by the neighborhood “old-timers.” I hope to attain that lofty status one day and hope many other “new-timers” like myself will join in the fun and struggle of maintaining the integrity of this great neighborhood. A small, dedicated core trade off the “glamorous” jobs as officers of COVNA. New blood is always needed and highly appreciated in organizations such as ours. Come to a meeting and bring a neighbor. I’m interested in the origins and history of this neighborhood. It was built far from the edge of other Austin developments of its kind beginning around 1970. I would appreciate long-time residents sharing their knowledge about the original development and any interesting events that have occurred during its history. You can email me at tabonyproductions@austin.rr.com or bring me any notes, articles, pictures, or anything else of interest to 2403 Vassal Dr.
Edward Dillard, a COVNA resident, died tragically January 20th at the age of seventy. He was riding his motorcycle enjoying the Hill Country scenery near Kyle and was struck by a car as it skidded out of control. Ed graduated from Mississippi State University, and served 26 years in the US Air Force, receiving numerous medals and merits of award. He was a much appreciated neighbor, helpful and well-liked by many. He is survived by his companion, Joyce Lammers, a long-time COVNA resident.